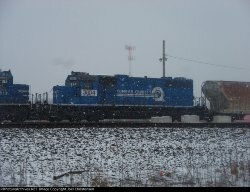 Welcome to Joel Christensen's Railroad Picture Archives! Welcome to the RRPictureArchives.NET contributor site of Joel Christensen. I have been a railfan pretty much since I have been out of diapers. While growing up in the Detroit area during the 90s; I was fed a good appetite of Conrail and Grand Trunk. Now grown up and living in the Southwest lower Michigan area; I still have a great volume of railroad activity to keep the hobby alive. My wife doesn't like the idea of me working on the railroad. I can not blame her since I probably would never be home. So train watching is all I am able to do. I hope you enjoy my photos. I am not a photographer by no means, but I enjoy taking photos while I sit and listen to metal grind against metal. My favorite railroads are CSX, Wheeling and lake Erie, Iowa Interstate, Fingerlakes, New York Susquehana and Western, Lycoming Valley, Indiana Harbor Belt, and Huron and Eastern. My favorite fallen flags are Conrail, Delaware and Hudson, The Milwaukee Road, Grand Trunk and Western, New York Central, and the Reading. Favorite locos are 4-8-4 Niagra, GP35, GP30, GP15, SD20, C39-8, C40-8, C40-9, RF16-A, and the BL2. No MORE Conrail Blue. :( NOOOOOOOOOOOOOOOOOOOOOOOOOOOOOOOOOOOOOOOOOOO!!!!!!!!!!!!!!!!!!!!!!!!!!!!!!!!!!!!!!!! !